A free VPN server keeps you connected while travelling. Worried About Safe Internet While On Vacation? Use Le VPN! A virtual private network is the latest rage now. As an internet user, you might want to visit certain websites, but are unable to do so because your government restricts these very websites on the grounds of national security. In that case, you need a virtual private network or VPN that routes the internet services to you. You need to use a free VPN server based in another location. The VPN will allow you to access these websites through their local network. If you think about it, a free VPN server is pretty helpful if you’re travelling all the time. When you are travelling, you would mostly be working on public Wi-Fi. That isn’t very secure, given cyber criminals are always on the prowl. Let’s take a look at why free VPN servers are important. Why Do You Need A Free VPN Server? Now you may ask why you’d need to route your services off to another network. Why not just use your own local network in order to access websites? Well, sometimes, that’s just not possible. The internet is free for all, and you can make the most of it. If there is something you need to look up on the internet, you can do so without the interference of your government. If you cannot access certain websites in your location, don’t worry. You can simply use a free VPN server. How A VPN Can Help? Such a virtual private network will allow you to route your location off to another location. For instance, if you are using a VPN based in the United States, then your network is connected to the local network in the US. That allows you to access any website you want without hindrance. The server thus acts like a middleman if you want to unblock websites. Similarly, when you’re travelling and using public Wi-Fi or shared computers to access the internet, you’re taking a big risk. Sharing data that is not encrypted through such public networks is not safe and is a major violation of cyber security. Instead, you should use a free VPN server while travelling. It works in the same way, as explained above. The data shared across this network is encrypted, and thus secured. If you are sharing credit card details, passwords, usernames, or such private information, a degree of precaution are must require. In that case, a virtual private network is your best shot since it protects you and your information, all with just one click. These are two main reasons why virtual private networks have garnered immense popularity globally. If you haven’t already, it’s high time you gave it a try. Le VPN is among the best VPN for vacation with quality servers across 114 nations. Once you subscribe for Le VPN service, the task is very easy. You need to download a simple software and use your login credentials. And hoopla! You are ready to start. 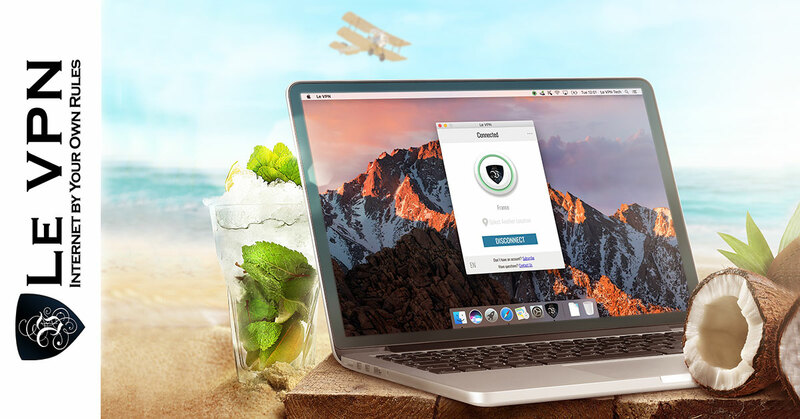 Above all, you can download the Le VPN software to your PC, Mac, Android or iOS device.